HomeLatest NewsFeaturedTEAM WALES PARACHEER TAKE GOLD! TEAM WALES PARACHEER TAKE GOLD! 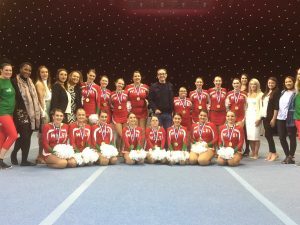 Assembly Member for Pontypridd for Pontypridd, Mick Antoniw was a special guest of Team Wales ParaCheer at their recent showcase event to celebrate winning gold in the ParaCheer Unified Freestyle Pom category at the ICU World Championships held in Florida, USA. The team comprises disabled and non-disabled dancers working together inclusively, with the majority of members coming from Pontypridd, Church Village, Tonteg and the Rhondda. Their gold medal winning performance was the ParaCheer teams first appearance at the World Championships.